This is our first web page. We hope to have a much better one at a later date. 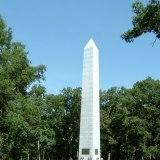 Our organization hopes to create a reliable and true list of those who fought at the Battle of Kings Mountain. It is our goal to educate the public as to the importance of the Battle. Membership in the Descendants of the Battle of Kings Mountain mush have an ancestor who fought or gave assistance to the militia on either side. We are accepting Patriot and Loyalist participants. We are open to men and women. Must have a line from a qualified person. SAR, SR, DAR, DVF and other groups record applications will be accepted as proof. All who join before 15 July 2013 will receive a Charter Certificate. After 15 July 2013 we will start to accept collateral applications.You can use the following link to see us on.